Now including a foreward by Bill Buford and photographs of Gellhorn with Hemingway, Dorothy Parker, Madame Chiang Kai-shek, Gary Cooper, and others, this new edition rediscovers the voice of an extraordinary woman and brings back into print an irresistibly entertaining classic. "Martha Gellhorn was so fearless in a male way, and yet utterly capable of making men melt," writes New Yorker literary editor Bill Buford. As a journalist, Gellhorn covered every military conflict from the Spanish Civil War to Vietnam and Nicaragua. She also bewitched Eleanor Roosevelt's secret love and enraptured Ernest Hemingway with her courage as they dodged shell fire together. 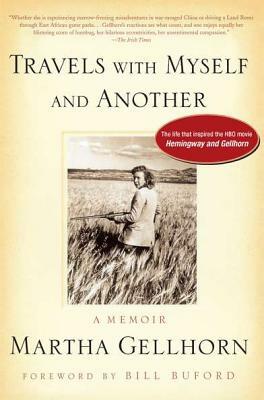 Hemingway is, of course, the unnamed "other" in the title of this tart memoir, first published in 1979, in which Gellhorn describes her globe-spanning adventures, both accompanied and alone. With razor-sharp humor and exceptional insight into place and character, she tells of a tense week spent among dissidents in Moscow; long days whiled away in a disused water tank with hippies clustered at Eilat on the Red Sea; and her journeys by sampan and horse to the interior of China during the Sino-Japanese War. Martha Gellhorn published five novels and seven prize-winning collections of her explosive journalism. Her career spanned several decades: She covered the 193738 war in Spain, sent dispatches from the front in World War II and followed the trail of Nazi war criminal Adolf Eichmann, and reported on the conflicts in Vietnam in 1966 and in Israel in 1967. Gellhorn died in 1998 at the age of eighty-nine.